Space Images | NASA's MISR Instrument Captures Stereo View of Mountain Fire Near Idyllwild, Calif.
Nearly 20 large wildland fires are currently raging in the western United States, fueled by severe and extreme drought conditions and high daytime temperatures. As of July 19, 2013, the Mountain Fire, which began on July 15 in the San Jacinto Wilderness in Southern California, had grown to more than 24,800 acres (nearly 39 square miles, or 100 square kilometers), forcing the evacuation of the nearby towns of Idyllwild and Fern Valley. More than 3,000 firefighting personnel are on the scene, but due to the ruggedness of the terrain, the fire is currently only 15 percent contained (http://www.inciweb.org/incident/3516/). 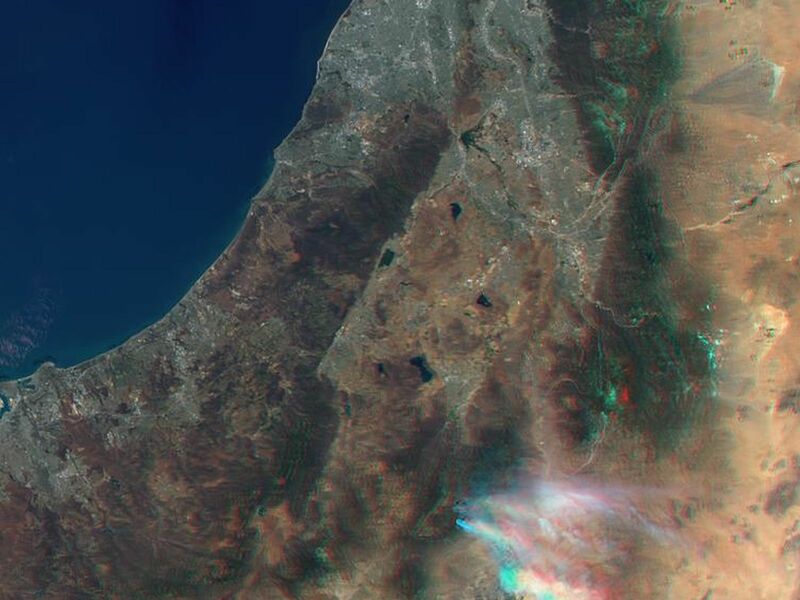 The Multi-angle Imaging SpectroRadiometer (MISR) instrument on NASA's Terra spacecraft passed over the wildfire around 11:40 a.m. PDT on July 17, 2013. 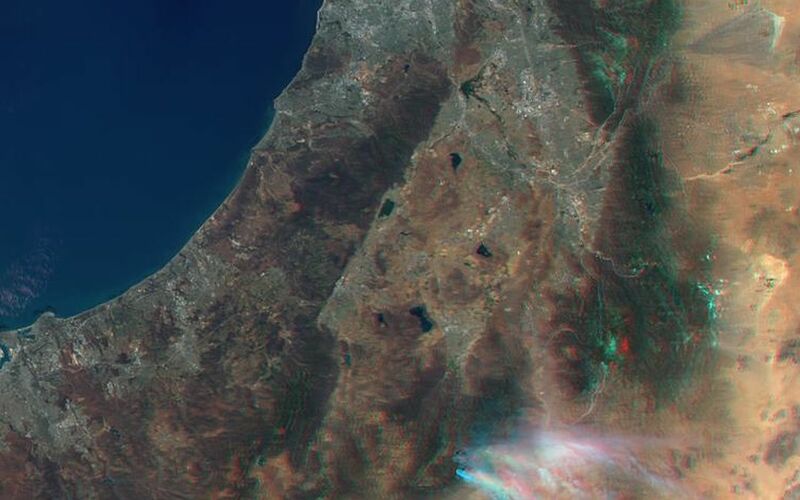 By combining information from different MISR cameras, a stereo anaglyph of the smoke plume associated with the Mountain Fire has been produced. The image is best viewed with standard "red/blue" 3-D glasses with the red lens over the left eye. The image is oriented with north to the right. The Pacific Ocean and Santa Catalina Island can be seen in the upper left. 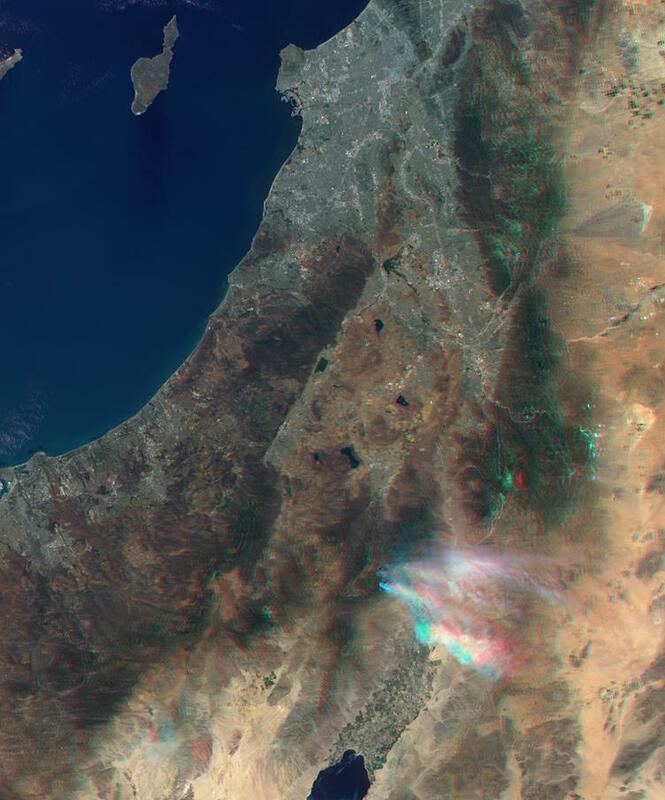 The complicated structure of the smoke apparent in the image is due to the presence of wind shear -- winds blowing at different speeds and from different directions at different heights in the atmosphere. The height of the terrain in the San Jacinto Mountains can also be made out in the image. Analyses of the MISR data indicate that the smoke from the fire reaches altitudes from 2.5 to 3 miles (4 to 5 kilometers) above sea level with very light winds at this time. The image extends from about 34.8 degrees north to 32.7 degrees north and 118.5 degrees west to 115.8 degrees west, covering about 143 miles (230 kilometers) in the north-south direction and 155 miles (250 kilometers) in the east-west direction. The images are a portion of the data acquired during Terra orbit 72236 from blocks 63 to 64 within World Reference System-2 path 40.